China smartphone companies are now cannibalizing sales from each other at the low end of the market while Apple and Samsung duke it out at the top. Samsung has remained the top smartphone manufacturer by doing well at both the high and low end of the market, giving it a 24.5 percent share in the first quarter of 2016. Apple came in second with 15.3 percent, followed by Huawei with 8.2 percent. 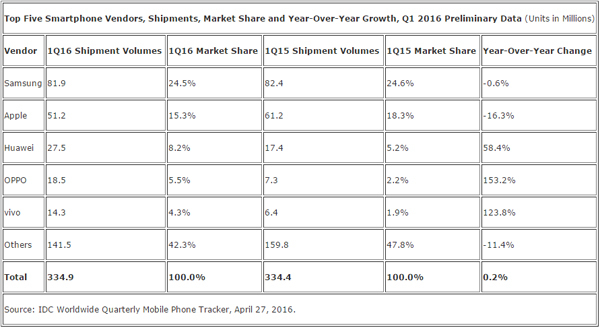 Huawei is seemingly the only China company with a firm grip in the smartphone market. Lenovo and Xiaomi fell out of the top five due to a surge in shipments from lesser-known China competitors Oppo and Vivo, which have 5.5 and 4.3 percent of the market, respectively. The latest shipment numbers come from IDC, which noted that Oppo and Vivo have concentrated on marketing and sales in lower-tier markets. Oppo has expanded through Asia, the Middle East and Africa, where smartphone growth has not plateaued yet. This is something Apple has struggled with, prompting it to introduce the iPhone SE, which surpassed expectations for the company and has been popular with people switching from Android. Still, first-time smartphone buyers remain largely out-of-reach for Apple. New opportunities in developing markets bring good news to companies that are best at competing on price. Xiaomi relies heavily on China and does not have a big presence outside its home country. Lenovo has been trying to expand, having purchased Motorola Mobility from Google in 2014, but it is much stronger in the PC market as the world’s largest PC maker. This raises interesting questions about China’s smartphone market. Huawei is best positioned to become effectively China’s Samsung, a company that targets the high and low end of the market. Other brands and makers in China are competing aggressively on price, though. The results for Oppo and Vivo show the importance of global expansion.